then you can start controlling your lights from your mobile phone by 'Smart Life' APP（ios or android）. The smart light switch also a normal switch,simply touch the switch to toggle your lights on or off. -Work with Alexa and Work with Google Home and IFTTT Light Switch. 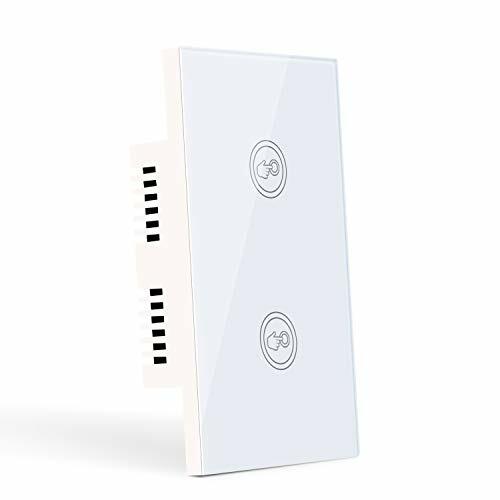 Compatible with Alexa and Work with Google Home and IFTTT Light Switch:Voice control supported, the smart wall switch works with Amazon Alexa, Echo Dot and Google Assistant. Turn on/off lights with voice commands. Save yourself the effort of press button especially when your hands are full. Life becomes so easy. Wifi Smart Light Switch:Download a free app"Smart Life" to your smartphone or tablet, you can have this smart switch connect to wifi (no hub required). Then just use your phone to remote control your home lights from anywhere and anytime. Never come home to a dark house. Start a smart life with a simple step. Timer Switch:Set lights to turn on/ off at a certain time or sync up with sunrise and sunset. (Need the switch connected with WIFI can be used) Never worry of forgetting to turn off lights. Or you can set schedule time to turn off rooming lights when your kids feel asleep. Life can be well scheduled. Elegant and useful design:Space saving design fits 3 switches in 1 gang wall box. Waterproof PC touch panel will better than glass and always look new and well compatible with your room. LED indicator helps you find the position of the switch easily in darkness. NOTE:Frist,this smart light switch can only match US standard 1 GANG switch box. The mounting bracket size: 3.6'' between up and down screw holes and 2.6'' wide. Second,this wifi switch needs neutral wire when instanlland.Be sure neutral wire is reserved in your switch box. If you have any questions about this product by Youngzuth, contact us by completing and submitting the form below. If you are looking for a specif part number, please include it with your message.